Digital Publishing is a contentious subject among educators. The transition between paper and digital has created gray areas and thoughts/opinions on the transformation to digital range widely and evolve consistently. With the kick-off of the 2014 EDUCAUSE Conference under way it’s a good time to take a look at the arguments presented. Do we burn the textbook? Does digital serve a higher purpose? Until November 2007 when Amazon introduced the Kindle, the only viable means of book distribution was paper. Any author who wanted to reach a mass audience needed a paper distribution partner. Any author could hire his or her own editor and his or her own cover design artist; he or she could even hire a printing press to create the actual books. The one service he or she couldn’t hire out was distribution. And publishers didn’t offer distribution as an a-la-carte service. The package service was always the best value, and there was no viable alternative otherwise. In textbook publishing, there has been little alternative to buying a traditional book from the publishers—particularly in Higher Education. Each professor expects their students to have access to the required text. Knowing that professors require specific texts, publishers are able to control the market (in an effort to stop borrowing and downloading illegal versions, etc.). They do this by publishing “updated” editions to their texts fairly frequently. It’s an effort on their part to “force” students to buy new textbooks—whether the content needs refreshing or not. Textbook costs increased an average of 186 percent from 1986 to 2005—a jump that saw several students dropping out of college simply because they couldn’t afford the books they needed for classes. Digital publishing clearly posed a solution to the issue and has pushed the industry ever-closer to its tipping point. Major publishers have spent hundreds of millions of dollars in the past few years buying up software companies and building new digital divisions, betting that the future will bring an expanded role for digital publishers in higher education. So far, publishers are only producing a limited number of titles in these born-digital formats, and the number of professors assigning them is relatively small. Only about 2 percent of textbooks sold at college bookstores are fully digital titles, according to a survey of 940 bookstores run by Follett Higher Education Group. As these new kinds of textbooks catch on, they raise questions about how much control publishers have over curriculum and the teaching process. It seems that the time has come for a different publishing model, and with it, real disruption. Publishers shouldn’t be the only organizations building these new textbooks. In fact, the most qualified organizations to be writing said texts are colleges themselves. Modern digital content management technologies can help universities not only transition from print to digital, but can also help the transition into self-publishing as well. Implementation is always key when it comes to new technology and, particularly with digital publishing, rash or jumpy behavior can kill the vision before it’s realized. Preparing appropriate digital initiatives, trainings, and continued professional development are all essential to creating buy-in and getting users to feel comfortable using the content management technology to begin creating digitally powered course curricula. But the payoff is definitely worth it. Self-publishing is great for universities and students alike. With universities as publishers, Higher Ed institutions start regaining control of the content used in their courses. Additional benefits include new revenue streams and the ability to provide students much better rates for books than students were able to get on their own, even for used textbooks. Plus, with the right technology, those who wanted to read the textbook on paper could print out the electronic version or pay an additional fee to buy an old-fashioned copy—a book. In readying myself for the conference, I had the opportunity to read The Other End of the Scale: Re-Thinking the Digital Experience in Higher Education on the EDUCAUSE Review. The article is full of conversation-starters, but one key message stood out. The move to digital learning has been defined by the “rhetoric of openness,” meaning the success or failure of any digital movement in higher-education is going to depend on collaboration—between faculty, students, and IT professionals. The same can be said of digital publishing. Failure on the part of textbook publishers to advance digital publishing could be attributed to the lack of collaboration between the publishers and the institutions, as well as the institutions and the students in order to determine which digital texts work properly and which don’t. 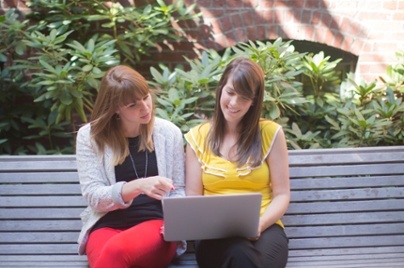 Improved communications are often a key factor in facilitating this type of collaboration. Continuing to ask “what kind of engagement do we want from our students,” and simultaneously, “how are they engaging with us now,” can help create the communicative foundation universities need to be able to collaborate properly with students. As the landscape of learning continues to grow and change, and more of our communications become mobile, institutions will need to be able to provide easy, immediate access to all forms of communication on all devices. Rather than using an old communications system that requires University IT departments to support each device individually, wouldn’t it make sense to employ an agnostic system—something that can be tailored to different users, and one that can be re-used repeatedly? A Unified Communications-enabled solution can be that device agnostic system for which you’re looking. Not only can it effectively tie professors, students, and faculty together across devices, it can also simultaneously create a recurring revenue model for your institution—licenses can “rented” and then easily re-used as students graduate. The technologies that will be most successful, however, are those that can combine the collaboration and digital publishing features to provide one, self-sustaining, self-informing communications solution. 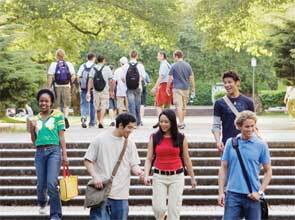 A collaborative content management system can centralize all processes and give universities one location from which students can get all requisite information and content, can access university-oriented social sharing/collaboration tools, and can be directly connected with faculty and professors through advanced UC functionality. A collaborative content management system can effectively tie everything together, giving universities total control so students and teachers can continue making the same sort of epistemological advances that are today, made in the traditional classroom with the traditional textbook. To learn more about Collaborative Content Management, check out our webinar and demo recording below. 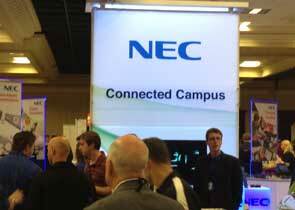 If you happen to be at EDUCAUSE this week, stop by booth 709 to chat with an NEC expert during normal Expo hours. This year’s 43rd Annual ACUTA conference and exhibition, which focuses on technology and communications in higher education, will be taking place near NEC headquarters here in Dallas, Texas. Conferences like ACUTA used to be simple. You registered, showed up for the event, went to a few workshops, got some free snacks, had a conversation or two, and went home. It was easy—one or two days of learning, and then back to work. But social media has changed all of that. The nature of conferences has changed from local affairs to global showcases with interactions between attendees occurring well before and after the event itself takes place. There are still those attendees though, who are so focused on getting as many in-person interactions out of their workshops, sessions, and conversations as they can, that they forget— or choose not—to utilize social media during the actual show. This, however, wouldn’t be the best way of going about things. Why? Because social media tools actually empower you to accelerate the networking process, make higher-quality connections, and feel more comfortable in a setting that, for many, can be challenging (i.e. lost luggage, a restless night, can’t find your co-workers etc.). As social media use continues to be embraced by the public, we see online conversations start well before the conference convenes—usually weeks in advance. The ACUTA event has several social media outlets that you can utilize to follow the interactive discussions taking place before the conference. These tools also will usually allow you to see who will be attending, to set up pre-conference meetings, to find out what the trending/hot topics are, and to judge the overall traction the conference is or is not gaining among your influencers and those you influence. With tools like Twitter or the official conference app, you can actually “meet” several people in advance of the show. Several ACUTA conversations are already taking place on LinkedIn, Twitter – where the official show hashtag is #AcutaConference14, and Facebook. 2. Eavesdrop on the other sessions. Most of us study the conference agenda well before the show date and select sessions or full tracks that pique our interest. But what happens when the panel starts and you quickly realize the topic or viewpoint is not what you were interested in originally? Social media gives you the opportunity to eavesdrop on the digital conversations happening in the other session rooms. This gives you the opportunity to discover more energetic exchanges that are equally or more relevant to your business than the one you are attending. Social media gives you the opportunity to get to know new contacts before you ever sit down with them. With tools like Twitter and LinkedIn, you can research their backgrounds to find where your common interests are, what conversations they are most active in, and learn a little about them as attendees. Then, when you schedule a time to grab a cup of coffee or talk shop between sessions, the time both of you spend together will be much more productive than it would have been pre-research. This gives you the opportunity to attend unofficial gatherings of attendees that usually take place at conferences. Many times these can be some of the most satisfying and productive networking events at the show. It also gives you the opportunity to stay in touch (on social media) long after the event, which in turn nurtures more meaningful deals and partnerships. Think of social media as taking notes, with the advantage of having dozens or even hundreds of others also taking notes and sharing them with you. This means your travel log is full of robust information that you can take back to other members of your team that didn’t get the opportunity to attend. Social media also gives you the chance to pick up quotes and statistics from the sessions you don’t have the time to attend, which can help spark further discussions and connections. And finally, attendees can use social media to interact directly with speakers. So you get an additional opportunity to chime in with your point of view, agree or disagree, and have a robust discussion with leading thought leaders in your industry. 5. Discuss after the show. Social media can actually help you manage your new contacts after the show, should you meet other attendees from whose technology experiences you want to learn more (or vice-versa). You can also use it to keep in touch with vendors whom you’ve met during the show. With so many different ways of keeping engaged—Facebook, LinkedIn, Twitter—you can easily maintain new contacts virtually, at least until you can get back to your office and follow-up with them more officially. If you are interested in discussing with us the advancement of higher education communications and collaboration technologies, then you should visit us this year at the show—taking place at the Hyatt Regency in downtown Dallas. If you are following a participant or vendor this year, or would like to learn more about NEC, give us a shout-out in the comments. Unified Communications (UC) solutions are not a single product or component, but an integrated set of features. Wikipedia defines UC as the integration of real-time communication services such as instant messaging (chat), presence, IP telephony, video conferencing, data sharing (including Interactive White Boards), and call control with non-real-time communication services such as unified messaging (integrated voicemail, e-mail, SMS and fax), but there are dozens of additional features available, and it seems like more are being added every day. By law, school districts are required to provide location information to their Public Safety Answering Point (PSAP) when a 911 call is placed. Providing that information is indeed essential, but it only scratches the surface of what your UC E911 service should provide. In addition to automatically updating the PSAP, E911 should also provide your emergency response team and internal designees with capabilities that allow your staff to assist first responders and address potential emergencies in real time. Instant screen-pop notifications: Whenever a 911 call is placed, notification messages should “pop up” on the appropriate administration or resource officer screens. These messages can identify the exact time, location, current duration of the call, and offer additional options for response. Listen and Barge-in: After being alerted of an in-progress 911 call, this feature allows designated District staff to listen to the call and can even choose to “barge in” and assist the conversation directly. Recording of incoming lines is another important part of a school district’s complete UC solution. Recording can be implemented in a variety of ways across schools for administration and support staff usage. The most flexible systems use concurrent licensing to allow for more economical and easier configuration, and these recording features can be applied to entire trunks, individual lines, or across the entire system for on-demand recording and playback. The two major impacts to your district are in security and internal management. Security: With recording of all district and school office incoming calls either by default or on-demand, any threats or incidents that occur utilizing the phone system will be captured and available for incident management and post-incident review. Combining recording features with your E911 functionality to automatically record every 911 call adds another layer of emergency response capability to your system. Staff and Parent Management: Allowing for on-demand or constant recording for staff and district offices means that any situations involving a parent, student, or staff members can be quickly evaluated and shared internally with appropriate individuals. Dealing with angry parents, addressing staff learning and management issues can all be easier when you have the actual conversations recorded and available. While there’s a lot of talk about integrating video and web conferencing for distance learning, asynchronous teaching and other pedagogy and matriculation related situations, even a basic audio conference bridge included now in most UC systems has tremendous potential to impact your school’s communications and security. Districts’ Emergency Response Teams (ERT’s) are using simple conference bridges to set up non-public DID numbers specifically for incident communication. Those numbers are shared only with the ERT, designated staff, and local first responders as part of their school emergency preparedness policies and manuals. When an incident occurs, no one is left scrambling to get the right people on the phone or calling out to individuals such as the Chief of Police or Fire Marshall; they are ready and available on a custom and secure conference bridge to keep everyone up-to-date. Adding web and video capabilities means that physical plant information, floor plans, and even live video feed can be shared instantly and easily as well. “User-centric communication” sounds like just another buzzword phrase, until you start thinking about the implications within your school. Trying to get an important call through to a specific teacher or staff member can be an exercise in frustration when you must consider schedules, room assignments, time of day, and other factors. With single number reach, the control of contact management is put into the system and the user’s hands; electronic staff directories with a single phone number per user will connect regardless of the class schedule using cell phones, desk phones, softphone on the PC or tablet, and can even ring home or other numbers – whatever the staff member and your telecom department allow for configuration. Adjusting contact endpoints based on time of day, room schedules, vacations, or even who it is that is calling is all possible with current UC technology, as is ringing several lines simultaneously. This can be combined with presence (allowing others to see scheduled status and location) and unified messaging (delivering voicemails to your email or other messaging software) for even more productivity and process gains. A component of UC that is often overlooked or minimized is the ability to generate call reports. Having an easy to use tool that allows comprehensive call management can make reporting an essential part of managing your telecom system. Call occurrence, quality, duration, full path (was it forwarded or transferred?) and other key metrics can all be used to reduce costs and manage usage. Reporting can provide detail about the operation of your system, can be organized and sorted by location or staff function, and can be a great way to manage expenses. Identifying over-usage of 411 calls, reporting on extended or repeat number dials, and highlighting long distance usage can all be used to assist in makeing administrative decisions. In one recent case, a faulty fax machine was found to be making repeat dials at all hours, costing the district thousands of dollars a year (and presumably untold frustration to the unlucky recipients)! We understand that the number of available features and functions in modern Unified Communications (UC) systems can be daunting, but we hope this list can be of help when it comes time to make a decision about which system is best for you. In the meantime, an Education Subject Matter Expert is available to answer questions, perform webinars and consult directly with your team. If you’d like to explore more ways your district can enhance or extend communications and security in schools, email michael.kastler@necam.com to schedule a call. NEC is in full force at the second full day of the 42nd Annual ACUTA conference and exhibition, which focuses on technology and communications in higher education. The show is taking place at the Manchester Grand Hyatt in San Diego, CA, until Wednesday. We are here at Booth 513 showcasing our portfolio of integrated solutions for higher education, which includes mobility, unified communications and cloud-based communications. You can also get real-time updates and photos from the show on Twitter via @NEC_Channels. 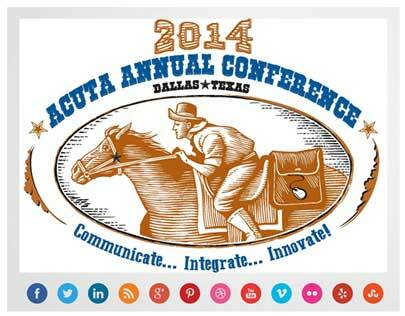 First off, if you’re not following the official ACUTA 2013 hash tag, you need to check it out – #acutaconference13. You’ll find ample content from show participants and vendors, session takeways and key conversations just waiting for your input. If you were unable to attend ACUTA 2013, following the official hash tag will help keep you updated on all of the happenings at the show. On the same note, the conference’s official Twitter page, @ACUTA, contains updated session and event information. ACUTA’s president for 2014, and an NEC customer, Mark Reynolds, is tweeting his personal ACUTA 2013 observations at @msreynolds55 (pictured below). Check out John Gallant, chief content officer of IDG, on Twitter @JohnGallant1. He moderated the conference keynote, “Envisioning the New IT Organization Through the Eyes of an Extraordinary CIO,” yesterday (pictured below). Another must-follow is Marty Parker and the great minds with @UCStrategies. There’s always something to learn from their unique insight on Unified Communications. This year, ACUTA introduced a new social medium called Rockzi. Just visit www.acuta.org/rockzi to keep tabs of the latest industry news from ACUTA participants and vendors. Are you following a participant or vendor at ACUTA 2013 that deserves a shoutout? Let us know by commenting below. Hey Buddy!, I found this information for you: "The iPhone and Mobile UC". Here is the website link: http://nectoday.com/the-iphone-and-mobile-uc/. Thank you.